Hello friends. In my usual overly verbose way I need to give you an update on what's going on. I just had a new member of our very elite club contact me regarding the book. Welcome Harry. This contact made me realize that there needs to be an update on how the various forces have changed my tangent somewhat but the overall objective is the same. That being that one day we are rid of Wegener's but now the focus has gotten wider in that one day I want to be witness to the elimination of all autoimmune disease. Back to the book. I have collected some very forthcoming stories from some great people who were willing to share in order to help others. The purpose of the book was to have somewhere where newly diagnosed people can go to for advice, hope and to see that there is indeed a light at the end of the tunnel, and it's not a train. I couldn't afford to self publish and the vision I had was not what the 'self publishing' companies offered, so it involved some solid work on laying it out (I'm not afraid of that and it's in my realm of skills, but the energy bit is what throws a wrench in the works.) I decided that if the objective was to give access to more information to people, it made no sense for me to be holding on to these stories while more people are getting diagnosed each day and looking for information. When I got sick, there was very little out there and compared to some of my dear friends that have been dealing with this for decades, I was lucky. I decided to put the stories on here so anyone can access them and use them to help with their own situation. I am missing a couple on the site because I didn't get a reply allowing me to post them from their owners, but it gives a good perspective. I haven't completely written off the book, but it's on the back-burner as I have chosen to channel my energy in a direction that I think is more likely to help us with our goal of eliminating this sucky disease. Find the Common Thread. That's what I feel with all my being is the answer and will lead us to a cure for ours and the 140 other autoimmune diseases out there. 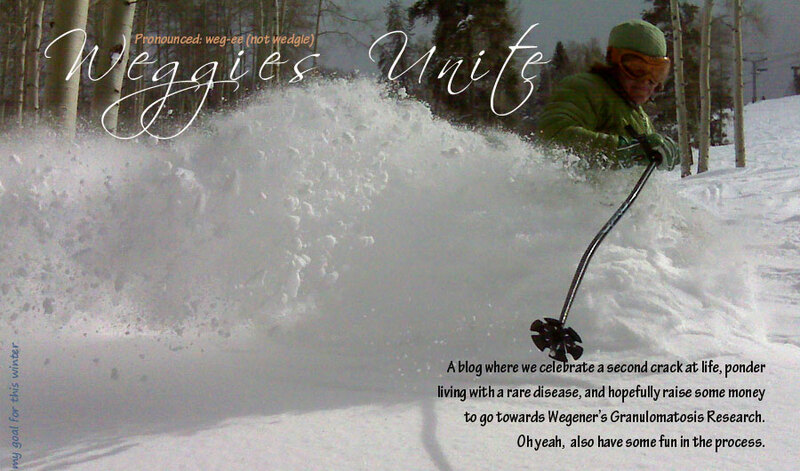 We can not only work towards saving the rare lucky bunch of Weggies but millions of people (one in five), save billions of dollars from our overburdened health care system and open all of that infrastructure for other diseases once we get out of the picture. We (autoimmunies, not just Weggies) are a big burden on the health care system being chronic and many of us incurable. I also think the answer is very close to the surface. We don't have to dig deep, just scratch the surface because so many people are working on their own disease and if we manage to get them to pool their efforts and data, the answer is not far. It's such a win win situation. AARDA (www.aarda.org) is doing this work in the US but not much happening in Canada. I have found my dharma and it took living with a crazy disease for a while to get to it, but now that I know what it is, I will do everything I can to see it materialize. I ramble on and on and I hope what I've rambled on about here makes sense. I admire people who can relay their thoughts in a few words. It's an art I have always admired but never achieved. Please forgive me.